When she recovered from the blatant insubordination, Edra stormed out of the transporter room. It didn't seem to happen often anymore, but her temper was flaring. She couldn't believe that Banks had gone against her orders. It had surprised her so much, she could only stand there until she'd transported herself off the ship. Now, the fact that she'd failed to act pissed her off almost as much as Banks' actions. As she entered the TurboLift and directed it to the Bridge, her thoughts turned to what she needed to do next. She could not let this go unanswered. She tapped her comm badge. 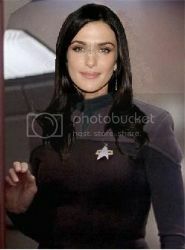 "Lt. Stewart, I want you in my Ready Room when you're done in Sickbay, please." As the doors opened to the Bridge, she received an acknowledgement from Constance. The current bridge crew turned her way when she stepped out, so she paused and addressed the senior officer. "We're holding right here for the moment. I'll be in the Ready Room. When I know our next move, I'll let you know." She continued to the door to the Ready Room, but stopped as they opened and turned back. "I want to know the moment there's the slightest movement from any of those...Cardassian ships." When she received their acknowledgement, she turned and entered the sanctuary of the private room, letting out her breath when the doors had shut behind her. Was any of this her fault? Could she have stopped this from happening? Her crew had been potentially exposed to...well, anything. She didnt know. And when Banks had mentioned it was a bioweapon, her first thought was of last year's medical leak, that only she and Henry knew had actually been a warning. What was this? Whatever it was, she wanted it off this ship, which it was now, but she'd wanted more control over it, And she certainly didn't want it falling into the wrong hands. But that choice had been take away from her by someone she thought she could trust. Just two days ago--or maybe it was three, the lack of sleep was playing havoc with her timing--she'd stood up for the woman without a second's hesitation. Now, she was fairly certain her trust had been misplaced. So what would she do with the woman who had paid no heed to her orders? Had any other member of her crew done the like, he or she would be thrown in the brig. So that's what Banks would have waiting for her when she got back. But how to get her there? She didn't imagine her going peacefully. And as much as she appreciated the skills of the Security department, Banks had skills that far outweighed their own. When Constance reported, they would discuss what to do with Banks when she got back. As she gazed out of the full-length window, she realized that something else was nagging at her. Something on the edge of her conscious, beyond the hurt of betrayal and feeling of failure. Something she hadn't yet quite figured out. However, the more she tried to pick it out of her thoughts, the farther it seemed from reach. She sighed, leaning her whole body against the window frame. She wished Henry were here. He would know what to do. With an inward laugh, she thought, this wouldn't have even happened if he were here. But as that thought rooted itself in her mind, she realized that was what was bugging her. If Henry had been here, this would not have happened, not because he could have stopped it, but because Banks would never have pulled this on him. She knew better. She'd taken advantage of a situation in which the one person who could phyisically stop her was out of the picture, and the person in charge was more maleable, not at her best. Had this been timed? Did she have something to do with it? She'd been willing to dismiss the idea earlier when there was an explanation, but she wondered about that explanation. Had Banks pulled the wool over her eyes again? Edra paced, stewing in the fury that coursed through her. She wanted to hit something, or throw something, but somehow she still had the capacity to realize that was a bad idea. She couldn't go somewhere appropriate either, as she was expecting Constance any minute. So instead, she sat down, and opened the computer, starting a message that would be sent to every crewmember about what they should do the moment she steps foot on this ship.